This past July, my husband and I stood on one of the most beautiful beaches I’ve ever seen. It seemed to stretch out forever, miles of white sand where kids were making castles and dogs were chasing balls. Standing there, under a bright- blue sky, it was almost impossible to imagine that this was the same blood-soaked beach — code-named Omaha — I had been learning about as I researched this book. I tried to imagine what it had been like for the American soldiers who attempted to come ashore on D-Day. I had read so many of their interviews and letters that I could almost hear their voices whispering to me as I walked the beach. Right here is where my friend died. Over there is where a boat filled with soldiers exploded. The whole ocean seemed to be filled with blood. More than three thousand men were hurt or killed on that beach. And truly, their spirits seemed to be all around. Being at that beach and thinking about all those who died broke my heart. But being in Normandy was inspiring. Because the people there continue to honor the soldiers — American, British, Canadian, and others — who risked and lost their lives to free the French people from the Nazis. In almost every town there is a museum, or a statue, or a memorial. There are streets named after American soldiers. I will never forget my day at the cemetery that sits right above Omaha Beach. There, in simple graves marked with Christian crosses and Jewish Stars of David, lie 9,385 of the men killed on D-Day. Writing about D-Day was often sad. And extremely difficult. Because of course, it’s not just the story of one day, one battle. It’s the story of one of the biggest, most complicated and tragic events in all of history: World War II. My books are historical fiction, which means the facts are true and the characters are fictional. But as I created Paul’s world, I wanted to give you a real idea of what it must have been like to live in a French town taken over by the Nazis. I based all of Paul’s experiences on those of real people I discovered in my research: Finding a paratrooper in a tree. Hiding an Allied soldier. Having a mom in the resistance. Coping with the fear that a Jewish friend might be taken in the night. Having a very creepy castle in your town. These are all experiences that real kids in Normandy had during World War II. I hope that my book has helped you connect with this time in history, and that it inspires you to want to learn more on your own. 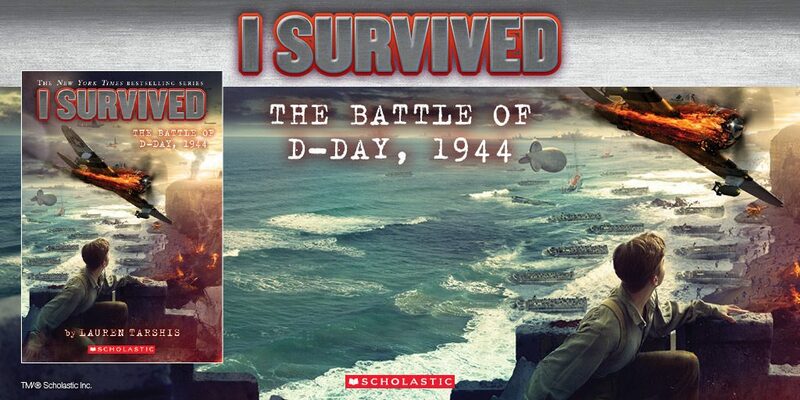 Writing each I Survived book is, for me, a huge adventure. I wish you many exciting learning adventures of our own.